Star Wars has quite a lot of Dark Red doesn't it? (Makes a change from bley.) It's a rich and regal colour so I'm sure many of you will find this plate of great use. There are two in 75019 AT-TE" . Next, let's look at some dark offerings from the Lord of the Rings. The 6x24 plate seems to be coming back in fashion. From 1966-1991 it appeared in nineteen sets in various colours, but then was only called upon for two more sets, in 1998 and 2002, before a long absence. It finally reappeared in 2012 with a vengeance, present in three sets and then another two in 2013; 79007 Battle at the Black Gate is one of them and is the first ever to feature it in Dark Bluish Grey. (It was never released in "old" Dark Grey.) 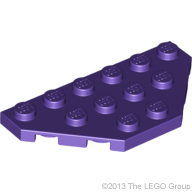 I'd wager this recent popularity is down to the lack of baseplates in current sets. This issue of diappearing baseplates was raised with the LEGO® Designers present at AFOLCON 2012 in Manchester UK, and the main reason cited in answer was the instability when you move a model built on a baseplate. We've all been there, yes? 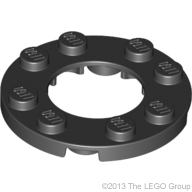 But they also made the point that plates are more useful than baseplates since you can attach parts underneath. 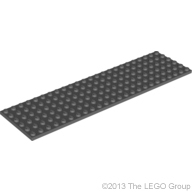 Fond of the baseplate as I am, I have to agree it is nicer to be commonly presented with a variety of large plates in sets instead - not just this 6x24 but also the 8x16 and 16x16. And as 10234 Sydney Opera House" proves, the era of the baseplate is not over yet with the 48x48 being produced in Blue [BL]/Bright Blue [TLG] for that set. When this part appeared last year I was thrilled, especially with the Trans-Clear [BL]/Transparent [TLG] version. So beautiful, quite aside from any functional use! Black is the fifth colour it has appeared in, and highly useful it shall be. You will find one in the massive 10237 The Tower of Orthanc" . Another round plate; a really useful one for landscaping and trees. 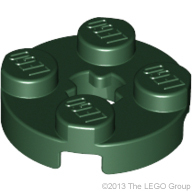 There are three in Creator 31010 Treehouse and one will also be found in a Christmas promo set, 40082. I feel like I'm always bigging up Friends on this blog for releasing new elements, so it's nice to see Creator come up with such a great one. Fantastic to see this released in my favourite shade of purple. Puppy's Playhouse is a set from Series 3 of the Friends Collectibles range, which have recently gone on sale here in the UK but at time of writing they're not yet available in the US. For a thorough and typically humorous review of this set (plus the other two from Series 3), check out SilentMode's site. Hooray, yet another useful part for Medium Lavender. Again, there are two. Thanks, Olivia! Hmm, not exactly a high five for this one Olivia, but I am a big fan of the Alien Conquest theme which used Dark Purple in the flying saucers, and this element will be great for making my own. See, purple's not just for girls, aliens like it too. 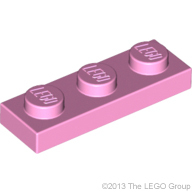 More 1X1 goodness from The Nether regions, this time in a brick. Here the quantities are far more decent - eleven! 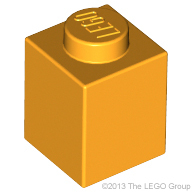 So if this is the kind of new element excitement we can now expect from the world of Minecraft, I say please release the rest of that world, LEGO! So there actually IS a reason to get the Minecr..aft sets! It's time to update your Bricklist, and it would be useful if there were an easy to find a link to it here on the blog somewhere, maybe accessible from the About page, or even directly from the blog's menu bar. Oh yeh. Joy. Glad you use it though... is it actually useful?! Yep. 'Specially when it's up to date! Genuinely forgot about it, after procrastinating about one and then writing a couple of posts not really about new elements :O) All done...I hope. 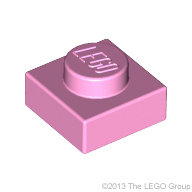 Link to BrickList now added to righthand menu. By the way folks... feel free to mark my BrickList as "helpful" if you find it so :o) Would be nice to make the list of Most Helpful! This question has been bugging me for a while. Perhaps you know the answer. What exactly does "Ø" stand for in the Ø designations? ^ Never mind. Googling about, I see it is simply a standard symbol for diameter, and does not itself stand for some word (in Danish, for instance). Actually, in Danish Ø or ø could be a word meaning "island", not that it's really applicable here. Not applicable, but a top trivia fact! Girls ARE aliens and not all are dark purple either. ^ Hey, you *other* Anonymous! For a small modicum of fun, go Google "what about us grils." They've put it to interesting use in official sets, like a round window frame on the Bag End set, and a two-color round stained glass window on the new Arkham Asylum. It could also be helpful as a "mortar" layer to hold together stacks of macaroni bricks, and it's obviously perfectly suited to interface with either of the two 4x2 half-cylinders. It joins the square version as being useful at some times when you have a central core structure that you need to build around separatey. If that makes sense. But my favourite use to date has to be Chris McVeigh's rotary phone... just brilliant. 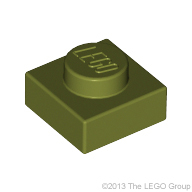 Regarding the olive green 1x1 plate, I was actually the first person to buy those on Bricklink. Paid $1.50 per for ten back in April because they don't make 1x1 _bricks_ in olive-green, and then I ended up putting that project on hold until about a week ago. And now you can buy those plates for 1/10 what I paid for them (or 1/20 if you want a _lot_). 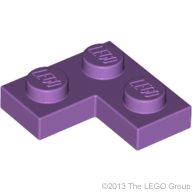 And dark-purple (the best purple - and I oughta know) 1x3 plates? Huh. I thought they already existed, but I guess they didn't (at least not officially). Those might come in handy if I make more Pixar Cars. There seems to be quite a share of various Dark Purple parts now, although most of them are quite rare having only been distributed in one or two sets each. Ah Dave I know the feeling! But it's nice just to have *had* them when no-one else did, eh. Eh, I could have cared less about other people owning them (and obviously, technically, the seller beat me to it and still owned more than what I bought). 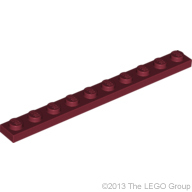 I'd still have much preferred bricks over plates, but the only other alternative was to put 1x2 bricks endwise, which would leave them sticking out inside, and that could interfere with future plans. As for the Knight Bus, there are lots of colors that have issues of that type. I constantly run into two different shades of basic orange. Dark-red was also really bad around that same time. And that's not even getting into the stuff they intentionally changed. But it's not a basic color. 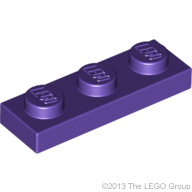 Purple was a basic color, and that has been dropped. 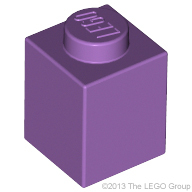 Dark-purple is one of the dark colors, which isn't even a complete group yet (no dark-yellow). I follow this blog from the first post and I'm really enjoying it. Thanks for the update. Anything in the new greens is a win for me!